Experience one of the most beautiful and remote countries in Africa with Semonkong Lodge. Landlocked by South Africa and commonly known as the Mountain Kingdom, Lesotho is a country with the highest lowest point in the world. Hiding away in the magnificent Maluti Mountains, you will discover the gem that is Semonkong Lodge, built on the banks of the Maletsunyane River using only local stone & thatch, offering just the right balance between civilisation and rustic elegance; a perfect base to explore this area on the iconic Basotho pony, mountain bikes or dare to take on the highest commercial abseil in the world. Just down the river from the lodge, the mighty Maletsunyane Falls is one of the highest single dropping Falls in Africa, creating a haze of smokey mist as the water plummets with savage splendour 186m down into a spectacular gorge. This is how Semonkong, The Place of Smoke, got its name. The well-known Duck and Donkey Tavern and Restaurant, provides a popular meeting place for both locals and guests and boasts affordable, delicious homemade meals and cold Maluti beers. Look out for our Winter Special for 2019, coming soon! 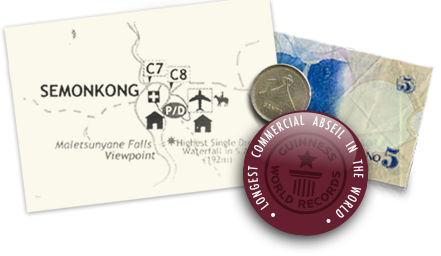 This is THE longest commercially operated single-drop abseil in the world as stated by Guinness World Records. Discover Lesotho on the back of a pony or on foot! Semonkong Lodge works together with the local community, hiring horses, guides and traditional huts. Wander through the magnificent scenery of Lesotho, with plenty of stops to enjoy the views. Visit a traditional beer brewing home, local bars & enjoy the local Basotho folk, their music & dancing. A different perspective of a waterfall, a gorge & life in general. Excellent support – felt extremely comfortable at all times. Thanks for the wonderful opportunity to explore the nature of Lesotho.